Maybe the bank robber needed the money to buy a watch. It would seem he needed one after arriving six minutes after the Guardian Credit Union in Waukesha closed. Police said a man wearing a ski mask entered the first set of doors at 5:36 p.m. Wednesday with a gun, apparently not realizing the bank was closed. via Wis. would-be robber arrives too late to rob bank – The York Daily Record. A truck hauling pomegranates crashed on the 5 Freeway Tuesday morning in the Santa Clarita area, creating a traffic nightmare for commuters headed to Los Angeles.The crash, involving two trucks, occurred just north of the junction with the Antelope Valley 14 Freeway at about 3:40 a.m., said Officer Patrick Kimball of theCalifornia Highway Patrol.The load of boxed pomegranates spilled onto the southbound 5 freeway, creating a mess which was blocking at least one lane. via Pomegranates on 5 Freeway – KTLA. 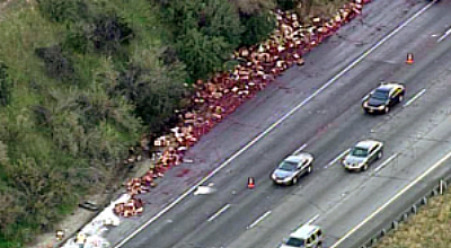 December 1, 2009 Posted by oldstersview | accident messes	| Comments Off on Pomegranate juice anyone?